Much has been said and written about the big two morning shows, Umagang Kay Ganda and Unang Hirit. From their respective successes, as well as failures, the coverage on these shows — at least here on Media Newser Philippines — has been well-documented. In recent years, morning shows have mushroomed on numerous TV networks and cable news channels. From TV5 to Bloomberg TV Philippines to ANC and CNN Philippines, all are determined to hold on to a chunk of their ratings pie. CNN Philippines, which initial morning offering, Headline News, only lasted less than a year, saw an opportunity in that market. And in 2016, the management led by CNN veteran Armie Jarin-Bennett launched the localized edition of New Day. 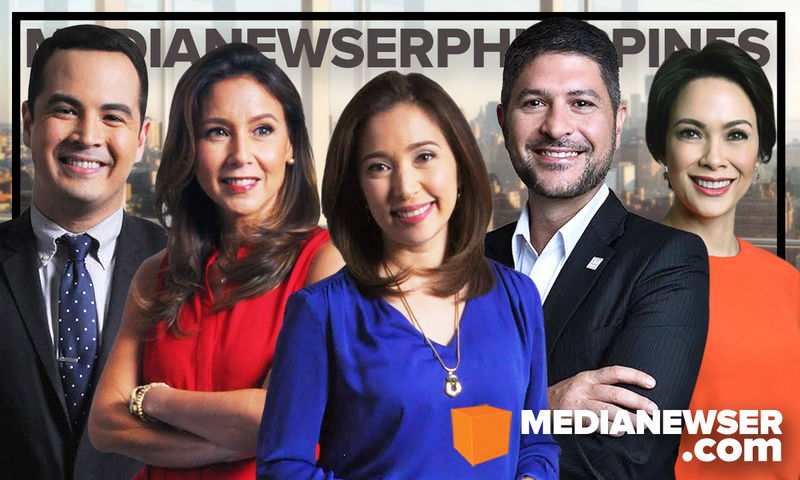 Now headlined by morning news veteran Claire Celdran, seasoned TV hosts Christine Jacob-Sandejas and Angel Jacob, popular motoring journalist James Deakin, and sportscaster Andrei Felix — the lone holdover from the previous team — New Day has been quietly and steadily gaining ground in the lucrative morning news race. "It’s a different flavor in a buffet of morning shows," said Jacob, also the host of Leading Women, about the show. "You go to a buffet table and you have your favorites, but there’s something new that catches the eye. It is interesting, fun and current." Celdran, who was dubbed as Philippine TV's "morning sunshine" during her time on the now-defunct Solar Daybreak, credits the show's staff, including its indefatigable executive producer Jan Acosta, for their ratings boost. "I think it's team work. Everyone who’s part of the show — our executive producer, director, producers, bookers, writers, editors, anchors, everyone — pull together and work hard to create a good program," she said. Felix agreed, adding that their EP does "a great job with the pace of the show." "It’s fast paced, you have local and international headlines, sports, traffic, weather and then some other lifestyle stories. It’s that perfect mix and combination of all the other stories," he said. 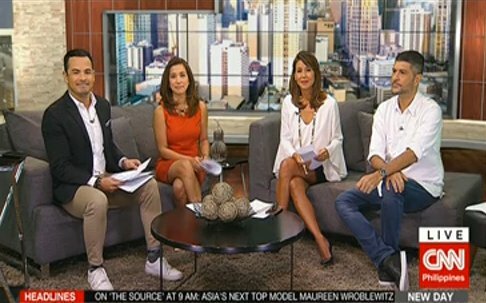 We recently caught up with the hosts of the fast-growing CNN Philippines morning show for a quick chat about their show's newfound success, fake news, and the best and worst thing about hosting a breakfast show. Be sure to join the conversation below or on our Facebook page. You can also tweet us @medianewserphil. Media Newser Philippines: Claire, you’ve been an anchor of your own program — Newsroom and Global Newsroom — what did it take for your bosses to persuade you to do morning television again? Claire Celdran: Adjustments had to be made within the company and as a team player, I made myself open to going back to the morning schedule. MNP: What did you miss about this format? Claire: The fun atmosphere, casual conversations and the perfect blend of hard and light news. MNP: You are basically the show’s news anchor. Covering the news during the Aquino administration, how do you think your network, or the media in general, should cover 2017 with Duterte as our president? Claire: We cover every administration regardless of who is sitting as President the same way we always have, with no biases. We are here to deliver accurate information and report the facts as they uncover. New Day's format, which Celdran described as "the perfect blend of hard and light news," has enabled the morning show veteran to do both news and interviews. MNP: Andrei, you are the lone holdover from the previous team. Tell us about the camaraderie this time around between you and your co-hosts. Andrei Felix: First of all I was really honored and privileged to still be part of the morning show. I remember when I was in high school up until college, I’d watch other morning shows in other networks. It was a dream come true for me when I had the chance to be part of a morning show when I was still in another network, but then I went to the States for a while and when I got back, I was given the chance to be part of this show. You gain friends and it’s just fun. It’s like having a second family, since my family is in the States. MNP: You are no stranger to morning TV having been one of the co-hosts of Umagang Kay Ganda. Tell us about your experience there and how is it different from your role here on New Day. Andrei: It’s very different. UKG is 3 hours, caters to the masses, purely Filipino, and there’s like 10 hosts every day. And I was always on the field, featuring all kinds of stuff from resorts, zip lines, to fiestas to wherever. I was really sent to all kinds of places. On New Day I get to stay in the studio which is fun because I get to interact with my co-hosts. I feel that I am in my comfort zone because this is what I love to do. I’ve also learned to love the traffic. I don’t love traffic like in Metro Manila, but telling people where it’s congested, where there is a vehicular accident or what not — you get to help and inform them, especially those who are leaving their homes or on the roads. MNP: Christine, you’ve hosted talk shows and most famously known for being part of a popular variety show in the 90’s. How much do you like hosting a morning show as compared to those other program formats I’ve just mentioned? Christine Jacob: I started hosting in 1990 giving me 27 years of experience. Luckily I started in both delivering the news — for PTV4 news updates and the evening news — and hosting a variety show like Eat Bulaga. This then opened my doors to several other shows like cooking shows, talk shows, beauty pageants, reality shows, sports shows and events such as the Olympics. The talk shows and variety shows taught me how enjoy and work with the audience, be spontaneous and how to interact with different people on stage. I love the fact that I have had the privilege to be part of both a serious news program and a variety show in the past and am happy that I am now back into the seriousness of things as one of the anchors for New Day. MNP: With those years of experience, what can you offer new and unique to New Day? Christine: From the 27 years of hosting experience, the best that I can bring to the table would be the lessons that I have learned. The experiences that have molded me to be who I am today — an Olympic athlete, a TV host, a wife, and a mom of five kids. "Now headlined by morning news veteran Claire Celdran, seasoned TV hosts Christine Jacob-Sandejas and Angel Jacob, popular motoring journalist James Deakin, and sportscaster Andrei Felix — the lone holdover from the previous team — New Day has been quietly and steadily gaining ground in the lucrative morning news race." MNP: Prior to doing New Day, Angel, you also had a stint on the now-defunct Breakfast. How does it feel like being part of a morning show ensemble again? Angel Jacob: I did not realize how much fun I had and how much I miss doing a morning show. There’s a different kind of energy in the morning. Personally, I get excited for Thursday and Friday mornings as these are my days on the show. MNP: Tell us about the dynamic between you and your co-hosts. How would you describe your on and off-cam relationship with them? Angel: Presently, I have a nice, fun and friendly relationship with my co-anchors. I have yet to establish a deeper relationship with each one of them. MNP: James, you are one of the busiest guys on TV today. How is this show similar or different to The Service Road? James Deakin: It’s similar in some ways because we cover traffic and whatever is on the headlines that affects people and the transport sector. But that’s pretty much where it ends. New Day covers just about everything since it’s supposed to be very general. So it will cover all facets of life. While The Service Road is very much dedicated to the transport industry and it zeros in to the problems that we face trying to get around this beautiful country of ours. MNP: You’ve been visible in some of CNN Philippines’ major news coverages. Would you like to do or cover more hard news? James: Yes, especially if it’s in my sector. For example, when the Anti-Distracted Driving Law came out and I was asked by Pia Hontiveros to go on News Night. I enjoyed that opportunity because you are able to reach as many people as possible. Because not everyone is into cars and will tune into a dedicated transport show, we are all road users. Every single one of us. You could almost split up everything into genders and demographics and social economic brackets except transport. Its affects everyone. So yes, I really want to represent that sector in the hard news — especially if it forces our authorities and policy makers to do things about these problems. MNP: You seem to have adjusted so well to this format. Do you see yourself eventually doing this for 5 days a week? If given a chance, would you like this job to be permanent? Christine: Do I see myself doing New Day 5 days a week? I would not mind. Why not? Angel: Yes! It will be an acknowledgement of my personal contribution to the show and to the network. Thank you. James: In theory, yes, but it’s almost impossible to hold 3 shows like that because I have The Service Road 5 days a week, Drive takes at least 2 days a week, so if I was going to put another 5 days a week at that hour in the morning, something would have to give. So I think it’s nice to have that one day a week, I think it keeps it kind of fresh too for the viewers. MNP: How would you describe your co-hosts? Let's start with you, Claire. Claire: Andrei is wonderful to work with. He carries a positive vibe with him that rubs off on people in a good way. Christine is just lovely. She’s sweet, focused, and a great team player. Angel is a ball of energy and fun to work with. She’s a professional and a veteran in the industry. James is great company. He’s articulate and very candid — he’ll tell you as it is. Andrei: I’ve always been a fan and an admirer of Claire and it’s a pleasure to work with her in the morning. I learn a lot from her, because she’s smart and quick. She’s perfect for the morning show. She’s also so positive and pleasant and that’s what’s needed in the morning. With Christine naman, I got to guest on her show Real Talk when I was still new, and she’s always been nice to me. She is a mother of 5 kids so you can sense that motherly nature sa kanya. She brings food, which I love! So sweet and thoughtful. And I call her “Momshie” once in a while. I look up to her when it comes to interviews. Angel, I call her my happy pill. She’s so hyper, bubbly, like a ray of sunshine. She’s just a bundle of energy and excitement which we need in the morning. She’s also great with interviews and she’s like the ate I never had. Tawagan nga namin Angel minsan “Beshies." With James, at first I was actually worried and kind of intimidated because I was the only guy for more than a year on the morning show, but I’m glad I didn’t have a hard time getting along with him. He’s is so witty that he can make any banter interesting because he’s so knowledgeable also. He’s quick and he’s funny. I look up to him also as my big brother. Christine: First of all they are all a bunch of talented individuals, and to top it off very nice people. Claire is such a sweet person. I love the cool and relaxed way she delivers the news. Andrei is a bundle of energy. I think he glues us all together. He goes out of his way to help, and encourage. Angel has also been in the industry for a long time. I wish I could work more with her. Unfortunately we alternate on New Day so I don't get the chance to see her. James also works only on Friday so I also miss out on getting to know more of him. Angel: Claire is caring, inquisitive and skilled in what she does. Andrei is fun, charming and sensitive. Christine is the mommy of the group, she brings food for everyone to enjoy. Really, I hope to get to know her better. James is funny, outspoken and sensitive as well. James: I think each one brings something so different to the table. That’s what I love the most. You’ve got Andrei who’s a great person to interact with because he’s just so vibrant and cheery. He’s just so positive. And you want that in the morning. He’s also a great sparring partner because he has a terrific sense of humor. Then you have Angel who really I get along with well because she’s so hip, she adds this whole freshness to the show. She’s funny, smart and very genuine; she just brings this whole different vibe to the show. Claire is the one who really keeps us on track. She’s like a school teacher there. She’s like, “Okay, guys, children, children, were getting out of hand. Two minutes lang 'yung banter.” This provides great structure. She keeps the show on track because she seems to be like the spine of the show because she delivers the news, then we get our little topics so it’s great. I think it’s a perfect set-up. I’ve never worked with Christine on the show since she’s not in the days I’m in, but I adore her as a person and we’re co-parents in our kids’ schools. MNP: I want to ask you about fake news. How do you think the media should counter it? Claire: I’m against fake news but we can’t stop people from accessing the internet and everything that’s in there. Fake news is a growing international concern. There should be an international body set-up specifically to help counter it. Locally, if you want to prevent fake news there should be a filtering system in place like they do in China but that could pose possible problems since that would be undemocratic. Angel: I don’t like fake news, the viewers don’t like fake news, and all media journalists don’t like fake news. I think it is an insult to anybody’s intelligence to be presented with fake news. Fake news has no place in professional journalism or media practice. James: I think we should have a zero tolerance approach to it. When I see fake news from another network, I feel weird about sharing it due to professional courtesy. You don’t want to be seen as attacking a competitor. But the other part of me is like, “Hey, they need to be called out.” Because once you let that pass once or twice, that’s it. It cements itself as a false truth. An alternative fact. MNP: What’s the best and worst thing about hosting a morning show? Claire: The best part would be delivering news in a more casual setting and getting to be with great company on the program. The worst, I won’t lie about it, are the hours. Andrei: I think the best part is waking up early which is also the worst thing because you can’t go out at night and you really have to sleep early and you have to get used to it. Also, there is no traffic in the morning. And then the chemistry is real, you can’t fake it. It translates [on screen], and the viewers can sense it especially when you banter with each other. Christine: Worst thing about hosting the morning news is when the alarm goes off at 3AM especially after a night of very little sleep. I ask myself, "Why am I doing this?” Then as I get out of bed, shower, and drive to the studio, it becomes clear to me that I love my job and I enjoy what I do. The best part is the people that I work with. It's like meeting up with friends early in the morning for coffee and chitchat. The live aspect of the news also adds an adrenaline factor and keeps me alert and on my toes. James: I love the vibe and the energy. I love the fact that people start their day with you. You are the first voice and face they see in the morning and you know that in a way you get to set the tone for their day. And that’s nice. The worst part is waking up. Period. MNP: As morning show hosts, viewers consider you as their companions. As James aptly said, "you are first voice and face they see in the morning." How much of your personal life are you willing to share? Claire: I’m pretty open to our viewers. I don’t hold back on personal stuff. I just don’t want to bore them with it. Andrei: As much as I want to keep my private life private, I can’t avoid it especially because of my previous high-profile relationships and I’m a transparent person. People can tell and see what I’m up to especially with social media. I don’t know if people really care about my personal life but it’s also nice to share that human side of you. Christine: After having been in the spotlight for 27 years I think I have shared my life joyfully and openly with the public. And now with the advancement of social media I don't think anyone can really keep things too private. Angel: Since I started in this industry some 20 plus years ago, my personal life has always been private, and it continues to be so. How much am I willing to share? Basic facts. James: I’m an open book! [Laughs.] I’ll share anything. You normally have to stop me from oversharing. MNP: Ratings went up since you all started in March. Where do you attribute the show’s newfound success? 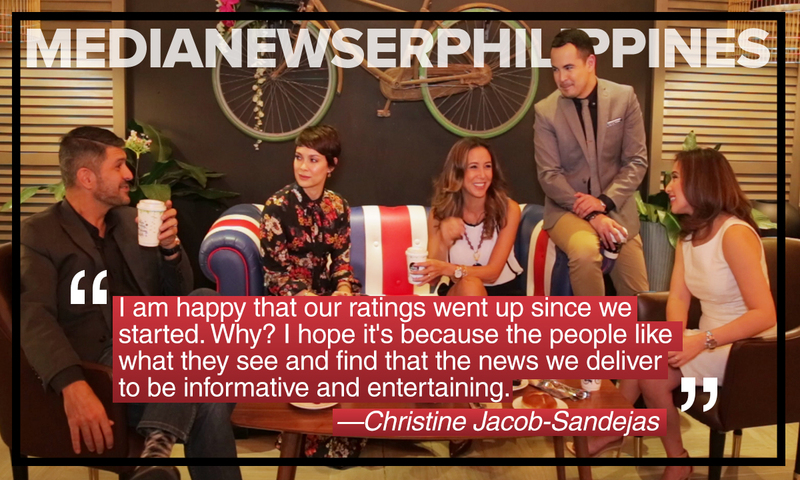 Christine: I am happy that our ratings went up since we started. Why? I hope it's because the people like what they see and find that the news we deliver to be informative and entertaining. Claire: I think it's team work. Everyone who’s part of the show — our executive producer, director, producers, bookers, writers, editors, anchors, everyone — pull together and work hard to create a good program. Andrei: It’s the shows format, credit goes to our executive producer, Jan Acosta, who’s doing a great job with the pace of the show. It’s fast paced, you have local and international headlines, sports, traffic, weather and then some other lifestyle stories. It’s that perfect mix and combination of all the other stories. James: I can only speak for my Fridays, of course. But if I put it down to one thing it’s the laughter. It’s contagious. There’s a natural chemistry there. We all complement each other. And if we always seem to be having fun, that’s because we are. We know when to be serious, of course, but when the banters allow it, the interaction and laughter is genuine. Angel: We’re a breath of fresh air in the morning. It’s a different flavor in a buffet of morning shows. You go to a buffet table and you have your favorites, but there’s something new that catches the eye. It is interesting, fun and current. MNP: Speaking of buffet of morning show, why do you think viewers should sample your show over the others? Claire: Every viewer has their own preference. The younger generation know what they want to see: from content to style of news delivery to the chemistry between the anchors. They look at those factors. As for the older generation, they see something fresh and new which keeps them from tuning to our show. Times are changing and news delivery has evolved from the old ways so it depends on viewers whether they want to stay with the old or try something new. Angel: I think we have the most interesting mix of hosts and we deliver both local and international news with a touch of international connection. James: It’s intelligent. The chemistry is good. We all have our styles of delivering but we’re never imposing. You are never patronize; we’re totally neutral. So there’s no fear of being sold on what to believe. There’s a genuine respect for the viewer. And I think that comes across in the way we deliver our news and our banters. Christine: We deliver straight to the point news, more quality over quantity. Andrei: Why New Day? Our 5 distinct personalities plus the entire format of the show plus the hardworking team, gives you the perfect blend of news and talk that our viewers need to start the day right. Information, conversation, inspiration and fun. We just want to set the tone with all the latest stories be it local, global, business, technology, entertainment, and sports. We also make it to a point that we interview the newsmakers and personalities who can talk about a wide range of topics that’s why we have guests.